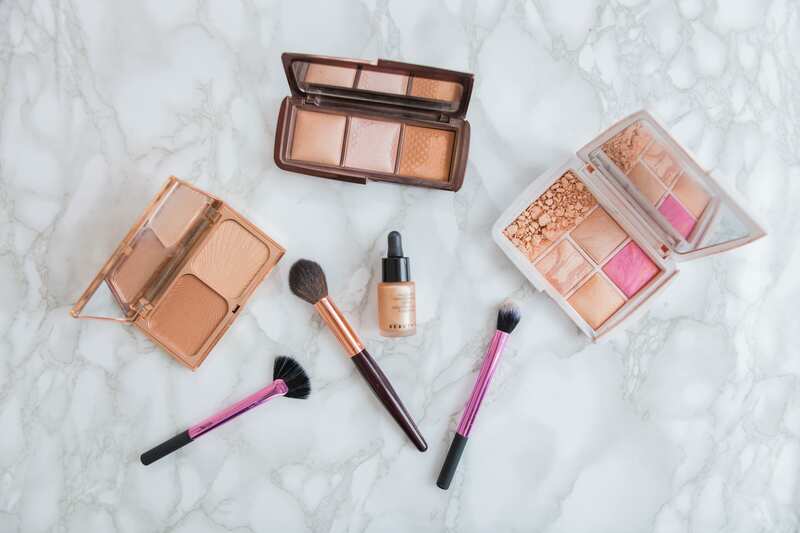 A good highlight is so important for brides to be glowing on their wedding day. I love to create a great one for my brides in my work as an Oxfordshire Bridal Makeup Artist. Too highlighted and you can look shiny/sweaty… But not highlighted enough and you can look flat and not particularly ‘special’. There is a small window of ‘perfect glowing bride’ and the myriad of products out there can be confusing. In this blog I will show you some of my favourite products and how I use them on my brides. Bronze and Glow comes in two shades – light/medium (shown here) and medium/dark. It is a bronzer/contour and highlight in one palette. The highlight verges on the sparkly if not used sparingly. My top tip for highlighting is always to build up the highlight. It can be hard to backtrack once you have reached ‘sparkly’ (and look like a vampire from Twilight!) but a clean, fluffy brush can help. I like to swirl this highlight across the very top of the cheekbones, down the centre of the nose and in a triangle shape on the forehead. A little dab on the top of the cupids bow can help lips look fuller too. Hourglass is an innovative, American, cruelty free cosmetics company, which has committed to becoming vegan by 2020. The have invested heavily in research and development and it shows. Their highlighters are, in my opinion, some of the very best you can buy. The tiny light reflecting pigments diffuse the light across the skin for a perfected look. 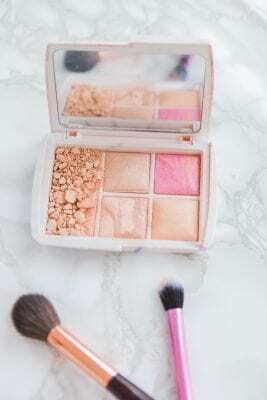 This palette is one of my absolute favourites and I reach for it constantly in my pro kit. It blends beautifully on top of other makeup which is a massive plus. My favourite way to use it is by buffing the peachy colour onto the very highest points of the cheekbones and up onto the temple by the hairline. 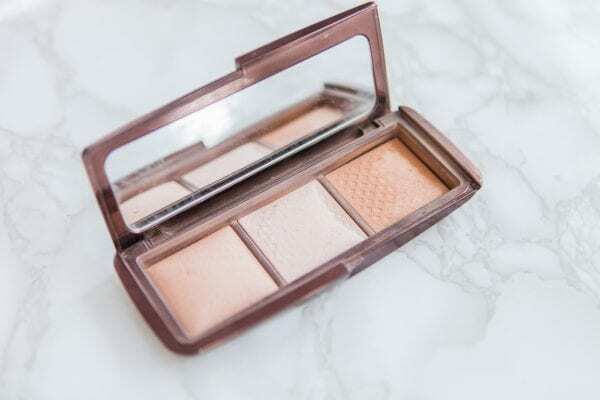 This gives a lovely sun touched glow, especially lovely on the fairest skin tones. I then sweep the lightest colour across the top of the cheekbones (it is very light, so tread carefully and build up that highlight!) I then use the middle tone to blend and connect the two areas already applied, on the forehead and finally a touch of the lightest shade on the cupids bow. 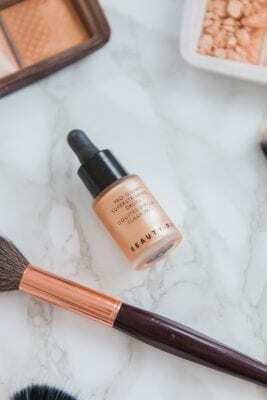 This is the only liquid highlight featured in this blog. The reason for that is that they are often quite hard to apply and blend quickly and well because they are soooo highlighting! This formula blends really well (if you’ve not discovered beauty pie, go and look them up, they have some excellent products and are INCREDIBLY well priced). My favourite two ways to use this product are firstly, by mixing a tiny drop in with foundation to create a ‘lit from within’ look. 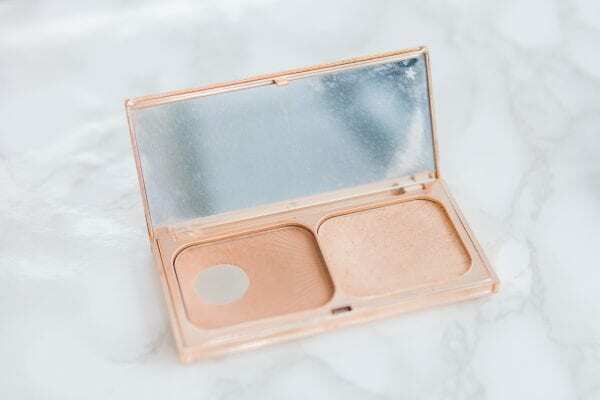 Secondly, for clients who want a stronger highlight, to pat the product along the cheekbone using the ring finger (it is the finger with which you can get the most featherlight touch), building up a beautiful glow. Another Hourglass palette to round us off. This one is a limited edition – a new one is released in time for each Christmas! They are incredibly well priced for the size of palette and they are all just amazing! This one is actually my own. I loved it too much to put it in my kit when the one I bought for clients was used up! As you can see, it is well used! I actually cried when I dropped it at a wedding fair! You can still find the 2018 edition (No.4) at Space NK. I really hope that you have found this post useful, if you have any questions or are looking for an Oxfordshire bridal makeup artist, do get in touch here!